India. 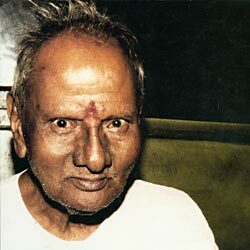 Sri Siddharameshwar Maharaj was his Guru. "Just keep in mind the feeling "I am," merge in it, till your mind and feeling become one. By repeated attempts you will stumble on the right balance of attention and affection and your mind will be firmly established in the thought-feeling "I am." "
"Before the world was, consciousness was. In consciousness it comes into being, in consciousness it lasts and into pure consciousness it dissolves. At the root of everything is the pure feeling of I Am. The state of mind, 'there is a world' is secondary, for to 'be,' I do not need a world, the world needs me." "I am dead already. Physical death will make no difference in my case. I am timeless being. I am free of desire or fear, because I do not remember the past, or imagine the future. Where there are no names and shapes, how can there be desires and fear? With desirelessness comes timelessness. I am safe, because what is not cannot touch what is. You feel unsafe, because you imagine danger. Of course, your body as such is complex and vulnerable and needs protection. But not you. Once you realize your own unassailable being, you will be at peace." "All these ideas of yours are binding you. Once you understand that there is no knowledge, that it is all ignorance, you are on your proper level. You have the idea that I have the knowledge; this is only an idea. Honestly speaking, there is no knowledge whatsoever. It is beyond all imagination, it has no attributes. It cannot be imagined at all."